As last year's overwhelming and not always accurate memorials to the outbreak of the First World War slide away into memory, we can start discussing the subject a little more seriously and look at the conflict as well as its aftermath, the Versailles order, from other points of view. In January after watching Testament of Youth, I wrote a dissatisfied posting. I had hoped that the centenary would bring out more than just more stuff about the Western front, the mud, the barbed wire, the sensitive young men hardened by the horrors, etc etc. The film, as I said, was very much in that group and not a particularly good example of it, either. As it happens, the film did not garner particularly good reviews and disappeared from the cinema screens surprisingly quickly. Had everyone had enough of the whole subject by the beginning of this year? Or was the film simply not appealing enough? There were, of course, a number of serious historical works published as well and, maybe, I should do a blog about some of them but the one that came out recently is of superlative interest to anyone who really wants to know about the causes of the war, its development and its aftermath. 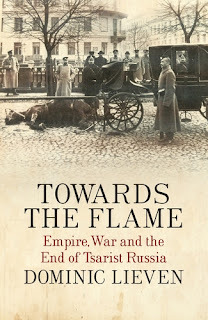 The book is called Towards the Flame and subtitled Empire, War and the End of Tsarist Russia and is by the eminent historian, Professor Dominic Lieven (yes, he is of that family though not, I believe, a direct descendant of the Russian Ambassador of the early nineteenth century). This underlines a basic point about the First World War: contrary to the near-universal assumption in the English-speaking world, the war was first and foremost an eastern European conflict. Its immediate origins lat in the murder of the Austrian heir at Sarajevo in southeastern Europe. The assassination of Franz Ferdinand on June 28, 1914, led to a confrontation between Austria and Russia, eastern Europe's two great empires. France and Britain were drawn into what started as a conflict in eastern Europe above all because of fears for their own security: the victory of the Austro-German alliance over Russia would tilt the European balance of power decisively towards Berlin and Vienna. The question before 1914 was who would be the dominant power in Central and Eastern Europe: Germany and Russia, with Austria-Hungary (as it was by then) naturally inclining to support Germany. Germany, says Professor Lieven, did not really have to win in the West: a draw would have been sufficient as long as Russia was defeated, something that was confidently predicted by 1916. In the end, Russia's defeat did not help Germany as the war in the West ended with the Allies' victory, thanks to the American entry into the war and those Eastern gains had to be surrendered. The Versailles order, set up in the wake of the victory in the West could be put together only because the situation in the East was rather peculiar. A war that started as a bitter to-the-death contest between Russia and Germany ended with both countries defeated and destroyed. It was, therefore, possible to dismember the Austro-Hungarian Empire and set up a number of small states that could not defend themselves against a strong and aggressive Germany or Russia (or, perhaps, both as it happened in 1939 in Poland and the Baltic states). The assumption that this state of affairs could go on indefinitely was rather strange. Sooner or later and probably sooner rather than later Germany and/or Russia would become strong again and there would be another catastrophe for Europe. So it turned out. The Versailles order that had excluded both Germany and Russia was inherently unstable. I hesitated whether this should come in this series of articles or not as it is a short piece, linked to an article by an historian who is most definitely not a Conservative and raises a question about modern politics. However, the article by Linda Colley, the well known historian, links present day arguments to Magna Carta and who am I to disagree with that. The article is well worth reading in full as it quotes various constitutional historians and thinkers with great verve and knowledge. Essentially, Professor Colley argues that Britain's exceptionalism in that the country with some of the oldest constitutional documents in modern history has no written constitution has to be brought to an end. Britain must have a written constitution, especially as, Professor Colley argues, Scotland is probably about to have one. There are one or two points on which I disagree with Professor Colley if I may be so bold and, indeed, insolent. In the first place, the idea of an independent Scotland has been put on what might be called a back burner since the referendum in which the Scots voted with a handsome majority in favour of staying in the United Kingdom. In any case, the offer of independence within the EU was a constitutional oxymoron. Secondly, it is not entirely true that Britain has no written constitution. She does not have a single constitutional document along the lines of the United States Constitution and it might be a very good idea to acquire one. I see no particular need for a Constitution like the French one, which has been re-written on a number of occasions and that applies to most others that are around. But the American one is important, particularly as it and its first ten Amendments, better known as the Bill of Rights, utilized many English ideas. Britain has a series of constitutional documents, of which Magna Carta is the first (well, more or less) and one of the most important ones. There are many others and the present government is suggesting that we should add to it with a new Bill of Rights. I wonder if Professor Colley agrees with that idea. Somehow I suspect that she might prefer the Human Rights Act and its overarching document the European Charter of Human Rights. But I may be wrong. That brings me to the most important problem: we do, as it happens have a written Constitution and that is the Consolidated European Treaties, which are the Constitution for the EU and its Member States. For some reason Professor Colley does not refer to it. Whether we need a single written constitution or not (and that needs to be discussed) there is no point to it while we are in the European Union, while European legislation comes above British Parliamentary legislation, while the ECJ and the ECHR are considered to be superior to British courts and while the Consolidated Treaties remain the overarching constitutional document. Is Professor Colley arguing for Brexit? Tory Historian's interest in the history of food ought to be well known to readers of this blog though not much has been written about that recently. But a new book on the subject is always good news, especially when that books is by the great Massimo Montanari. 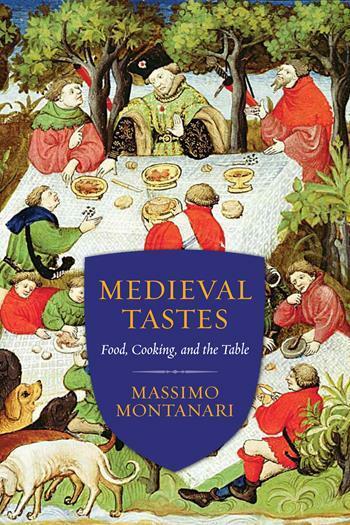 Medieval Tastes, first published in Italian and now in English by Columbia University Press is a fascinating account and analysis of what we know and what we can surmise about life and food in the Middle Ages, a long and ever changing period. In his introductory chapter Professor Montanari tackles the ambivalent attitude so many of us take towards the Middle Ages (a vague and simplified term along with "long ago"), on the one hand hankering for some strange notion of purity and supposed healthfulness (an attitude that disregards the reality of life for most people, including the rich in those centuries) and on the other hand seeing those centuries as uniformly dark and oppressive (which disregards the many and varied achievements). The two attitudes, which he calls the "tenebrous" and the "luminous" Middle Ages have grown out of different post-Mediaeval historic and literary developments. The obscure Middle Ages and the luminous one live side by side today in the collective imagination, which has digested and assimilated both premises, blending them in an unforeseeable manner. But when it comes to food, the Middle Ages are decidedly and exclusively good, for they represent the nostalgic dream of a pure and uncontaminated past that guarantees authenticity and quality. Things change when the marketing of the Middle Ages introduces theme events, festivals, and rural and municipal feasts - all very common in many European countries - offering historical processions with ladies in costume, knights in noble combat, archery contests, games in the central square along with reconstructions of artisans's shops and markets and all kinds of amenities under the aegis of a Middle Ages filled with warmth and goodness, genuine humanity and profound sentiments. During those festivals, however, even the other Middle Ages are revealed (and later become preponderant), reflecting the obscure and malevolent, with their classic stereotypes of black magic, witches, torture, poisoning and exorcisms of fears and anxieties that are in us but that we prefer to relegate to a finished past. 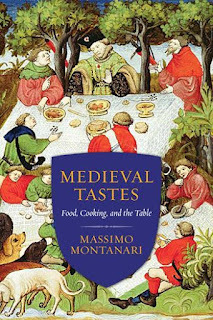 Even gastronomy enters into this world of festivals when the tenebrous Middle Ages cohabit with the luminous Middle Ages. this would seem to be the "good" side, with its habitual trousseau of platitudes about the healthfulness, tastiness, and purity of medieval food. But beware: here, we are no longer talking about simple products, or products that boasts "medieval origins". Here, we are talking about cuisine and recipes prepared in the medieval manner, or presumed such. Marketing of entertainment tends to follow certain fashions and one just has to accept that. Of greater interest is what transpires from that rather muddled attitude to "mediaeval food" and customs and that is a complete lack of desire to understand, merely to use the expression "mediaeval" as a symbol of various modern fears and longings. There will be more as TH progresses with the book.